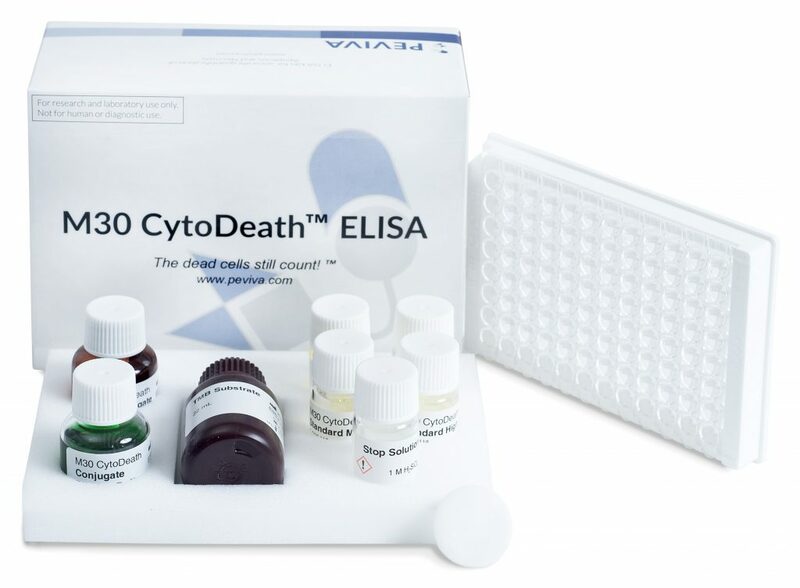 The M30 CytoDeath™ ELISA is a novel research kit developed for cell culture applications. The M30 CytoDeath™ assay has a dynamic range and sensitivity suitable for in vitro work. M30 CytoDeath™ ELISA is a powerful drug screening tool. It is useful for in vitro characterization of apoptosis-inducing drugs, including establishment of time course kinetics and dose response relationships. The effects of large numbers of siRNAs on apoptosis can be tested in the 96 well format. The assay offers a unique possibility to quantify apoptosis of epithelially derived cells in multicellular spheroids and organ culture systems. The M30 CytoDeath™ ELISA is based on the M30 antibody (detecting the Asp396 caspase-cleavage site on CK18) and antibody M6. This combination is different from that used in the M30-Apoptosense® ELISA. 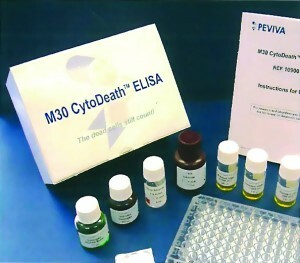 The M30 CytoDeath™ ELISA is not suitable for serum/plasma. Powerful tool for in vitro characterization of apoptosis-inducing drugs. M6 Coated Microstrips: One microplate, 12 strips with 8 wells each, 96 dry wells in total. The wells are coated with mouse monoclonal K18 antibody M6. The microplate is sealed in an aluminium bag, which contains a desiccating device. If not all the strips are used, reseal the bag and keep the desiccating device inside. Ready for use! M30 CytoDeath HRP Conjugate: Concentrate (24 × conc.). One vial containing 0.4 mL of mouse monoclonal M30 antibody (anti-K18Asp396 neo-epitope) conjugated with horseradish peroxidase (HRP) in a phosphate buffer with protein stabilizers. Preservative added. Should be diluted with M30 CytoDeath Conjugate Dilution Buffer (see Instructions for Use section “Component Preparation” on page 9). Note! Do not expose to light! M30 CytoDeath Conjugate Dilution Buffer: One vial containing 11 mL of phosphate buffer with protein stabilizers for dilution of the M30 CytoDeath HRP Conjugate. Preservative added. Green colored. M30 CytoDeath Standards: Standard Zero containing 0.5 mL of phosphate buffer with fetal calf serum (FCS). Standards Low, Medium and High, 0.5 mL each, containing standard material in a phosphate buffer with FCS. The values of the Standards are 0 U/L (Zero), 250 U/L (Low), 1 000 U/L (Medium) and 3 000 U/L (High). Preservative added. Yellow colored. Ready for use! Standard Zero can be used for dilutions of samples > 3 000 U/L. Wash Tablet: One tablet for 500 mL of prepared wash solution. Dissolve the Wash Tablet in 500 mL of fresh deionised water. TMB Substrate: One bottle containing 22 mL of TMB (3,3’,5,5’-Tetramethylbenzidine) Substrate. Note! Do not expose to light! Ready for use! 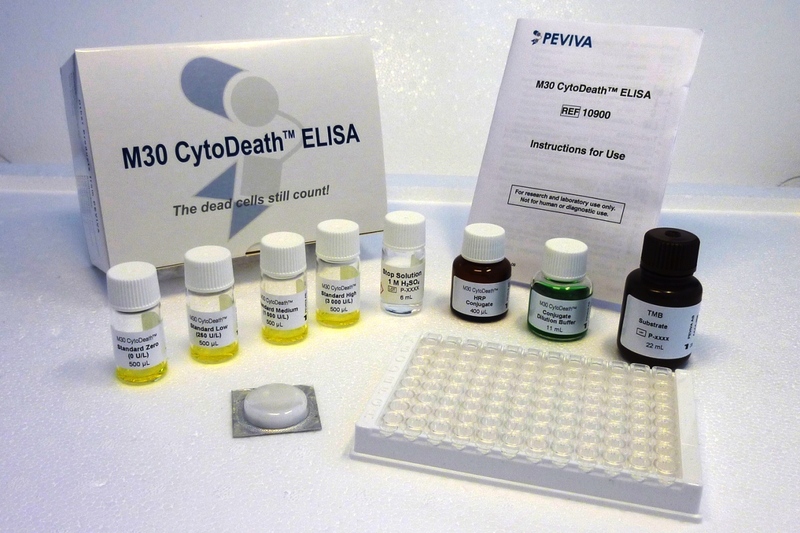 The M30 CytoDeath™ ELISA is a solid-phase sandwich enzyme immunoassay. Standards and samples react with a solid phase capture antibody M6 directed against K18 and the HRP (horseradish peroxidase) conjugated M30 antibody directed against the K18Asp396 neo-epitope. Unbound conjugate is removed by a washing step. TMB Substrate is added. The color development is stopped and the absorbance is read. The resulting color is directly proportional to the concentration of the analyte. By plotting a standard curve from known concentrations versus measured absorbance, the amount of antigen in the sample can be calculated. The concentration of the antigen is expressed as units per liter (U/L). In a study presented at the SOT Meeting in 2014, toxicity testing on cryopreserved differentiated HepaRG™ cells was performed using CK18 kits. HepaRG™ cells exhibit many characteristics of primary human hepatocytes, including morphology and expression of key metabolic enzymes, nuclear receptors, and drug transporters. Unlike HepG2 cells, HepaRG™ cells have high P450 activity and complete expression of all nuclear receptors. HepaRG™ was exposed to different compounds, including paracetamol, chloropromazine, rotenone, rosiglitazone and omeprazole. Toxicity and apoptosis were assayed from collected cell culture supernatants measuring M65 and M30 levels. M65 results were consistent with cell viability, whereas, M30 results indicated that apoptosis was induced at lower drug concentrations while necrosis was more prominent at higher ones (see figure below). Human HepRG™ hepatocytes treated with different compounds. 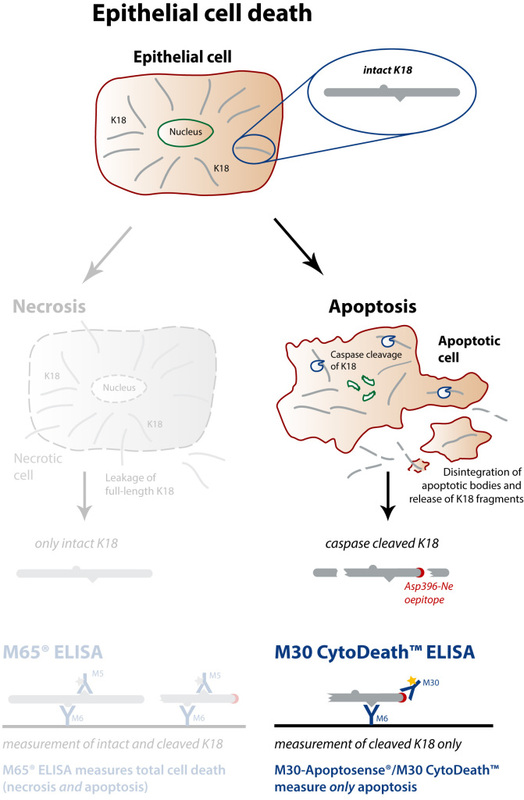 Toxicity and apoptosis were assessed from collected supernatants measuring full-length K18 (M65) and caspase-cleaved K18 (ccK18, M30) using M65 EpiDeath® and M30 CytoDeath™ ELISA. M65 and M30 kits robustly detect cell toxicity and apoptosis in HepaRG cells in vitro experiments. A additional key feature is that the CK18 kits measure an accumulated caspase-derived product, so there is no risk to miss time of apoptosis and transient caspase activation (See figure below).